Wow... one hundred Spoils of the Weeks! In the past 18 months I've managed to fill 99 volumes of this column (plus some bonus ".5" columns) with over 1200 individual reviews, which is frankly quite staggering for me to consider. This was conceived of as a fun spin on and merging of haul posts and toy reviews with the sole goal of being something that could keep me writing rather than just wishing I was writing. I have a tendency to fall into the all-too-familiar traps of laziness and procrastination, so (though I've had to skip a few weeks and others have been writing right up to posting) I must confess a sense of pride in having accomplished this small feat. As such, I wanted to do something special for this centennial edition. 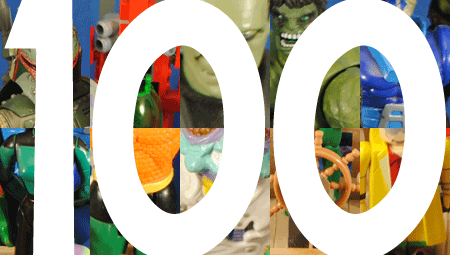 Somewhat inspired by Monkey Boy's recent "Top Ten Action Figures" POA, I've decided to celebrate this milestone with a look at several figures which have had some sort of significant impact on my life as a collector. In essence, this will be "Spoils of my Collection." So, join me on this adventure through three decades of toys and collectibles! When I was a kid I distinctly remember asking Santa for a pirate ship one Christmas. 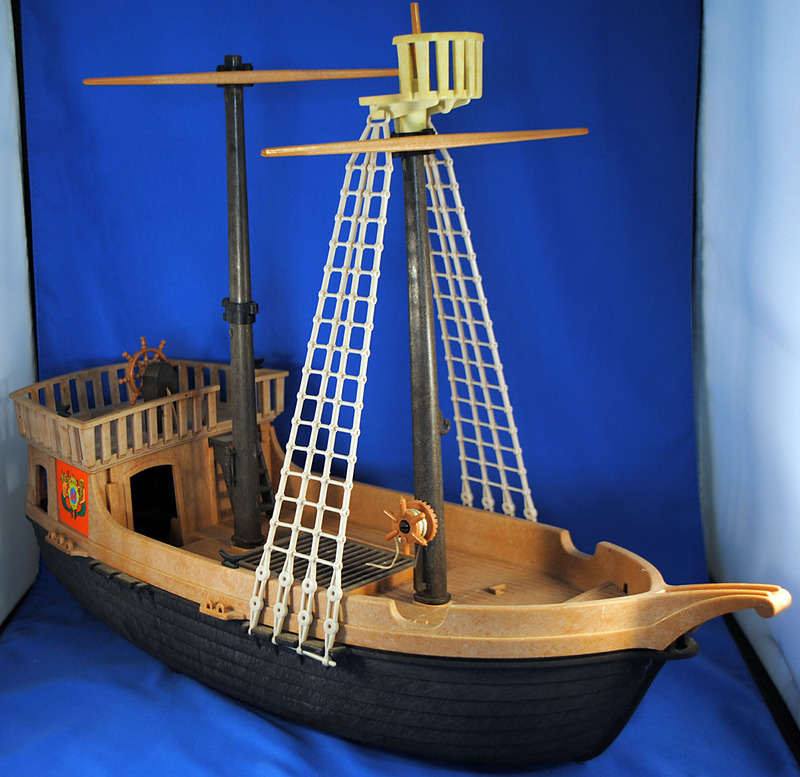 Not a toy, but a real pirate ship. I sort of figured I was testing, if not outsmarting, his "presents down the chimney" routine, but since I grew up in a coastal town I partly expected I'd wake and instead of a massive boat-sized present there'd be a tiny one. In it would be a big old key, and my parents would drive us down to the wharf where I could use it to access my own personal pirate ship! Well, imagine my shock when I found not a huge package nor a tiny one, but a fairly typical sized one. What was up here? I ripped the paper off to discover one the biggest disappointments in my young life (I still remember that confusion and sadness) - it was a toy pirate ship!? I was bitter, and pouty - it ruined my Christmas. Well, fast forward a couple hours and we head off to my grandparents house for "Family Christmas" and it's suggested I bring the ship along to play with, so I obliged trying to be nice to my parents. Eventually I resigned to going off and playing with it, and then - magic. Slowly over the next few hours this awful present turned into my favorite toy! This started my life-long passion for Playmobil and I can scarcely think of a toy that had a bigger impact on my life. It opened so much imagination, play and diorama possibilities I'd never even conceived of! This was originally released in 1978, but I must have gotten the 1985 release... though I always thought this was an '87 present and I'm pretty certain I got it before the '88 third release. Could I have really had for that long!? 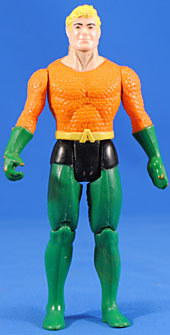 I had a handful of Super Powers figures growing up and while Superman and Batman were regular stars in my play time it was Aquaman who had a more profound affect on me. I knew little of the character but I absolutely loved this toy. The color combinations really clicked for me and the scaled shirt was unlike any other toy I had (note the early draw to sculptural detail). I specifically remember being obsessed with the fins on the back of calves. This is one of the first toys I can remember loving for itself, not for the property it was based upon, and as I result it had a sort of reverse affect on me. I collect Aquaman figures pretty much exclusively as a result of my life long love of this figure and there are few toys in my vast collection that I can point which had such an impact on me. I think I may be able to point to this as the genesis of my love/preference for Silver Age DC costumes, too. In researching the figure I was shocked to see this came out in '84. I can only assume I got it from the re-release in '85 but even that seems too young for me to have been. This show hit me like an explosion and I was nuts for toys (indeed I specifically remember standing in line for the first movie playing with a belt bag full of figures) and I'm surprised to see the cartoon was on for about two years before these showed up. I was so into TMNT that I lost my mind when it was announced that Universal Studios (Hollywood) was adding a Ninja Turtle "attraction." It turned out to be a glorified meet-n-greet. I remember waiting in line on the now-gone lower deck area overlooking Burbank and the backlot, eventually entering a room themed to look like a New York City alley. There was a Channel 6 news van parked in there and April O'Neil (!) was standing in front of a mounted camera reporting on breaking news of mutant turtle sightings. As the line moved past her she'd ask kids various, canned questions and you could see yourself "live" on the TVs sticking out the back of the news van. Being a pretty shy kid I was getting nervous and wondering what I'd get asked and how I'd answer. I got to the front and April freakin' O'Neil (!!!) asked me who my favorite turtle is. "Michaelangelo!" I exclaimed. "And why is that?" "'Cause he's a party dude and so am I!" Oh the joys of youth! I don't remember much after that (I think we walked past a guy in a Shredder costume or maybe some Foot before meeting guys in Turtle costumes) eventually we exited out on to some ascending stairs. At the top was a booth where they handed each kid a free toy. My sister got Baxter and I got the Rat King. It was great at first but then looking at them... well long story short I forced her to trade with me (and the immediately regretted that now I didn't have Rat King and spent months trying to steal hers or convince my parents to buy me one [they ultimately did]). This is one of the coolest, craziest toys! It's just a beautiful design and really offered a lot of play options. I was especially a big fan his extra, little mutant arms. This was the first TMNT toy I ever had as was the beginning of a long love affair with the franchise. 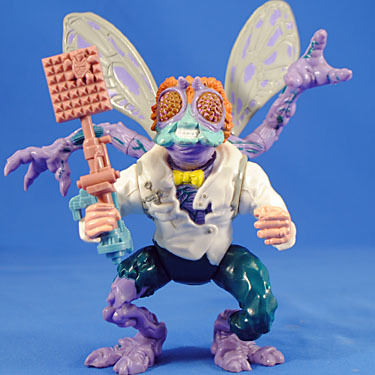 I would really, really love to see this version of Baxter return or be adapted into the new show so that we can get another toy of this awesome nerd-beast. Like all kids in my generation, the only thing comparable to the power of the Ninja Turtles was the X-Men, mainly fueled by a confluence of the ToyBiz figures and the Saban cartoon (da-da-da-da-daaaa-dah-duh). 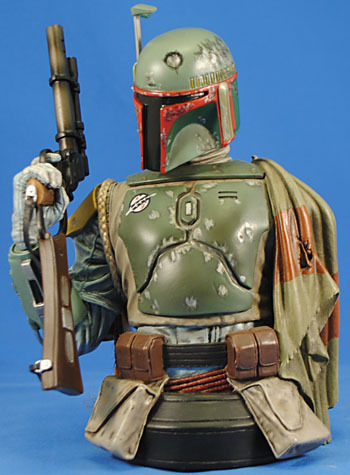 I was big into the toys and had most of them but this figure stands out as a seminal moment in my collecting - this was the first time I specifically noticed and appreciated the sculpt (though it would still be several years before my pre-internet mind realized that these toys were actually sculpted by someone and didn't just magically 'appear'). 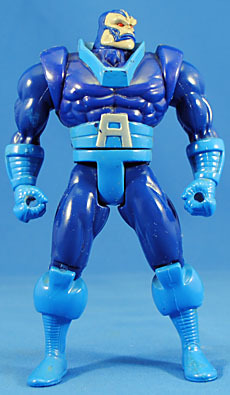 The figure itself is a great design with some wonderful bulk, which has (like Aquaman) led to a lifelong passion for the character, and he had some cool alternate arms (which are in some other attic-based box separate from the one I found this guy in) but it's the head that won me over. There is some intangible quality to it that rocked my world. It scratches some conceptual itch I never knew I had. The wide jowls, the thin, long cranium, the deep set eyes, the tiny nose, the deep-etched lines - it's incredible. There's a sharpness to the detail unlike anything I'd seen up until that time and I basically just became obsessed with his head. To this day it is what Apocalypse looks like to me. This was the first toy to attract me on a more-than-a-plaything level and as a source of what I might now call "art." I shockingly don't have the large scale version of this figure, but it is on my list and hopefully I will come across it at a convention some day. Playmates' TNG line marked an incredibly important moment in my life. I specifically recall flipping over the card after buying some more Series 1 figures and realizing that I had Every Single Figure they'd released. I now had to wait until they made new figures. Never before in my life had I been in that situation, and the conscious thought of having completed a set and now having to wait for the next I mark as the moment I stopped being a kid playing with toys and became a Toy Collector. Sadly, I don't recall what figure it was which that happened with, but this "duty uniform" Troi also marks an important event for me. I never saw this figure in stores, but, vastly preferring her uniform to her causal jumpsuit, I wanted it desperately. I did see it once at a gift shop at Sea World, but they charged double SRP and I couldn't justify that cost in my young mind, still so fresh and free from the concept of "grails." But this figure was a grail - one of, if not my first and, as such, with the advent of eBay she was the first figure I hunted down and bought through a second-hand source. It was my first step into collecting beyond the shelves of mass market stores and opened the proverbial flood gates. 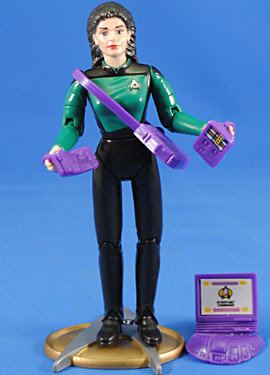 I can't look at this toy, or even any incarnation of Troi in this uniform, and not think of this story and how important it was that I find her and how satisfying it was to finally add her to the collection. I stepped on to the action figure aisle of the local Target in late '98 and was shocked to see this figure - something I had no idea was coming. Being a human, male, and nerd of course I'd always been into the famous monsters, but in a more passing, tangential way. This figure, well, it changed everything. It was the gateway drug into UMM for me and spawned a passion that still burns some 15 years later. This sculpt is great and I absolutely adore the base. The torch and shackle accessories are neat too (man, where did I put that bag of accessories? 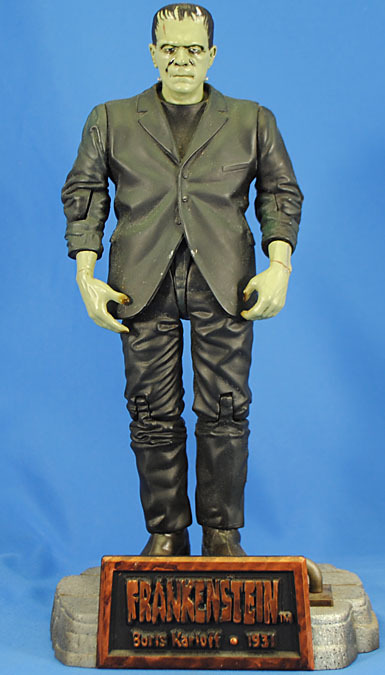 ), and the paint is good but fairly broad and, of course, he's a weird 8" scale. 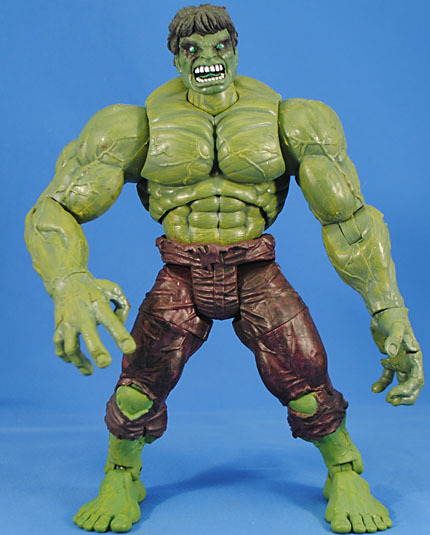 Still though, this guy was part of one the best action figure lines of all time (in your author's most humble of opinions) and really did kick off a love affair that's a big part of who I am today. Pulling this guy out of his ensconcement in the Marvel Legends box I've got to say I'm impressed with how well he holds up in sculpt, paint and articulation over a decade later. Historically this is, of course, a significant figure being in the first series of the "line that changed the hobby," but to me he will always have a more personal importance. I have a habit of just hanging out at toy booths while at SDCC ogling the new figures for long periods of time. That year, I kept going back to ToyBiz's booth to gaze longingly at the Spider-man Classics and Lord of the Rings prototypes, so much so I sort of built up a shy, nervous rapport with Jesse Falcon. At one point we were chatting a bit, I was complimenting his figures and he told me to be back the next day at a certain time for something special. Whem I returned at that time the booth was enthronged with about 20 or 30 people and I eventually had to settle on standing by the side, and that's when I saw this figure moments before it's world wide reveal being handed from the incomparable Eddie Wires to Jesse. After it was revealed and everyone lost their minds I found Jesse and complimented him profusely. He said "don't thank me, this guy sculpted it" and thus I was introduced to, and shook the hand of Phil Ramirez who said "no way, it's this guy - he painted it" and so I met and shook hands with Eddie. Being so wildly shy I didn't build or maintain friendships with those guys to my great lament, but this figure will always make me fondly remember meeting and thanking three of the most important men in action figures. I am a compulsive completist. I know this, you know this, ...dogs know this. Everyone knows it. And so it was that I was very resolved in NOT getting into resin since that was clearly going to be a very expensive slippery slope. I had picked up one or two LotR busts from Sideshow but was able to keep a lid on things until Gentle Giant happened to be selling their remaining stock of this awesome bust one year at SDCC. How could I say no to that? It's gorgeous and sold out everywhere quickly. I verified they still had him there and the rest is history. I probably have close to 100 resin pieces now and while some might argue me breaking down and buying into this format was inevitable I really credit this as the piece that won me over. It is mini-bust perfection. Pose, sculpt, paint - it just works perfectly. Plus, with an edition size of 7500 it's a grand reminder of how strong the resin market once was. I am a huge, huge Back to the Future fan and want toys so badly I even planned out my own toy line for it in high school (complete with card art designs and casepack ratios). 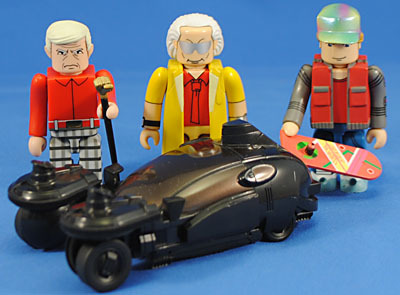 I managed sit out the rather bland looking blind-box series of Kubricks based on the first film, but when news and photos came out of three 3-packs featuring the sequels, well that meant all the bases were covered and being that these were as close to BttF figures as we'd ever come I knew I had to buy in. And thus it was that this was the first import line I fully collected. I have everything (except for the black & white repaints from the DVD release and the exceedingly rare "Enchantment Under the Sea" Marty) but what really marks this as significant to me is my first, full reach outside of US collectibles. It's also a reminder of what collecting imports used to mean. Nowadays we're spoiled by most things getting distribution channels to the US but back then... it was conventions and eBay, and man you think prices now are bad? Well actually, to be fair, prices were all over the place since sellers really had you over a barrel but some didn't realize it. Fortunately I was able to score these at reasonable rates through eBay amd I got this set first, partly due to a good price and partly due the the 2015 costumes being my favorite and the most toyetic. Each box included a Delorean Time Machine, except for this one. Through some crafty licensing loopholes and studio prop re-use, it actually includes a stylized Spinner from Blade Runner - not bad! Like all boys I had a few Lego sets as a kid but for whatever reason it just never caught on with me. There were a few sets over the years I was into but nothing that really compelled me to spend the money of the compared-to-action-figures expensive sets. Well, that all changed with their Atlantis line in 2010. Space Police had been an engaging lead up, almost drawing me in with its neat aliens and cool ships but the Design Team really hit their stride on this line. 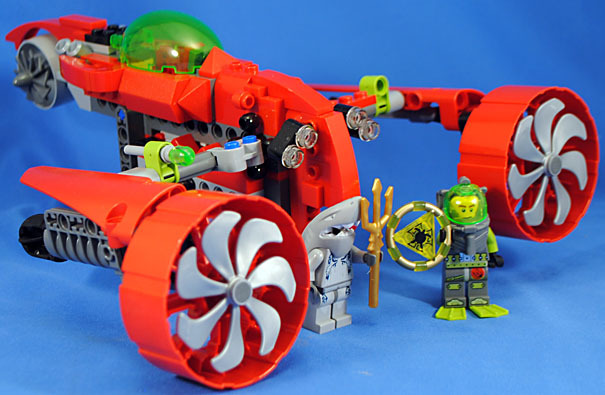 Water has also been a big draw for me (see "Pirate Ship" and "Aquaman" above) so the cool designs in vivid red of submarines broke me and I bought my first Lego set in decades. I started with this as it has a cool design and was moderately priced but it was only a matter of months before I completed the theme and eventually spread out into other themes and became the monster what hath unleashed no less than four "Legormageddons." Lego is a great, though pricy, toy addiction to have and, for me, it all started here. So that's my 100th Spoils, featuring the most significant toys in my collection. Fell free to tell me what you think on our message board!